Courage vs. discrimination – audiobooks free this week! 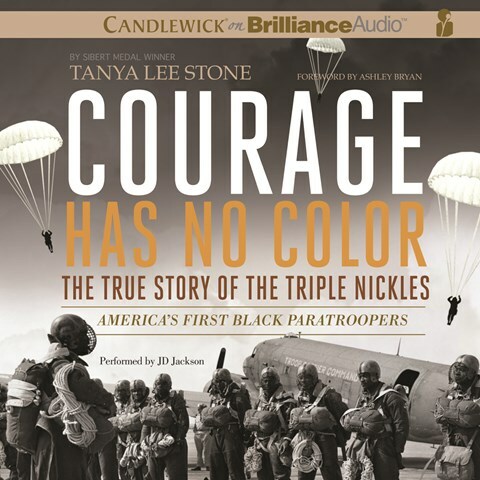 This week’s free audiobooks from SYNC feature courage in the face of racial discrimination, ready for you to read with your ears! Remember that although these complete audiobooks are only available from Thursday through Wednesday, you have free use of them as long as you keep them on your computer or electronic device. Click on a title to go straight to its free download page at AudioSync – download only requires your name and an email address. During World War II, the first American black paratroopers fought a little-known Japanese attack on the West Coast, as well as widespread prejudice throughout the US military. A great YA novel considering the Triple Nickles from the viewpoint of a black officer’s son is Jump Into the Sky, by Shelley Pearsall (my recommendation here). A black detective from California begins investigating murder in a small Alabama town during desegregation in the 1960s – this is the off-Broadway production based on the novel which was adapted into award-winning movie and television series. Other tales of discrimination-fighting that you’d recommend?